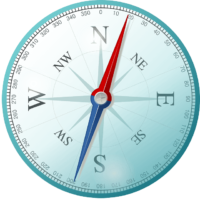 A compass is an essential tool for outdoor activities like hiking, hunting, kayaking, and boating. It can also be very useful if you are traveling in an unfamiliar city and lose your bearing. If you are going to be very active and you don’t want to worry about protecting your watch from the elements then a G-Shock is the natural choice. 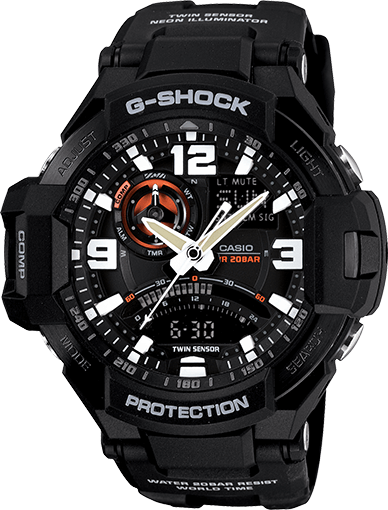 A G-Shock watch has extreme shock resistance, a thick protective bezel with a recessed display to prevent scratches, and 200 meter water-resistance for worry-free operation in any conditions. If your activities are highly dependent on a compass then be sure to carry a backup compass for emergencies. 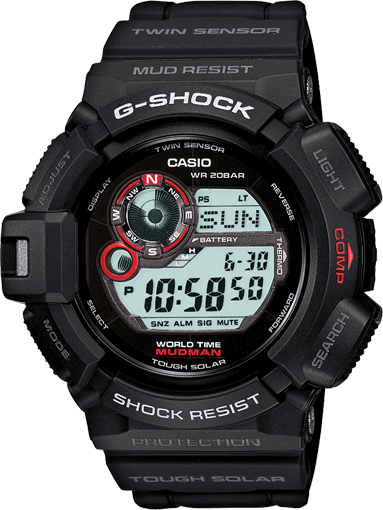 If you plan on using the G-Shock compass sensor on a regular basis you should consider getting a Tough Solar model, as the battery-powered models only have an estimated battery life of 2 years, and using the compass sensor a lot will drain the battery. 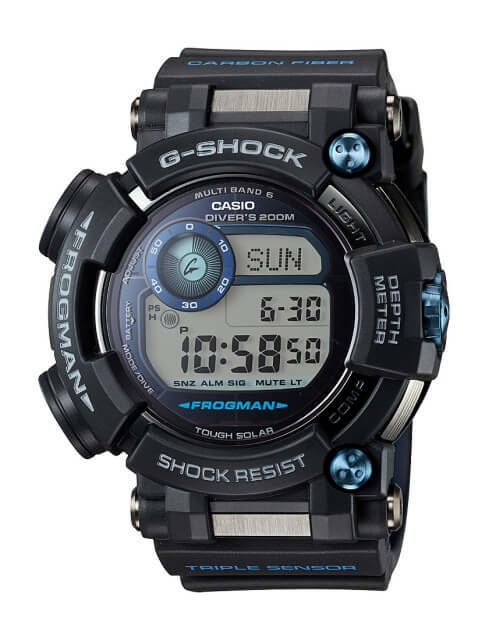 Tough Solar G-Shock watches have a rechargeable battery that is recharged by a solar panel on the face of the watch, so you do not have to worry about running the battery down. If always having the most accurate time is a priority then choose a model with Multi-Band 6 which syncs the time through radio wave reception from six transmitters around the world. The Twin Sensor models include a compass and thermometer sensor. Watches with Triple Sensor Version 3 have reduced power usage and improved battery efficiency, and also include altimeter and barometer sensors to measure altitude and atmospheric pressure. 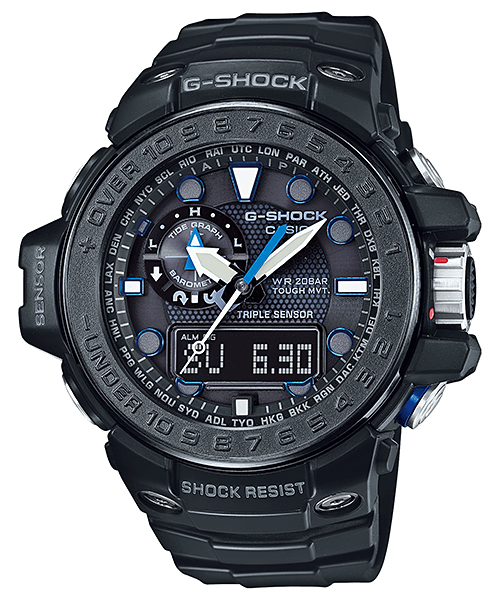 A Triple Sensor G-Shock is also known as an “ABC watch.” There are currently eight G-Shock watches with a compass sensor. Here they are from least to most expensive. 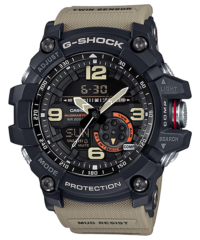 G-Shock G-9300 Mudman - The G-9300 is the latest version of the mud and dust-resistant Mudman, now equipped with a compass and thermometer. 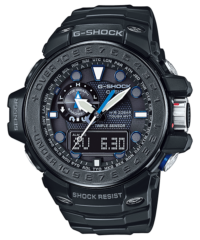 G-Shock GA-1000 - The GA-1000 is part of the G-Shock Aviation Series. It is an analog-digital model that uses the second hand to point north when in compass mode, like the other analog G-Shock compass watches. 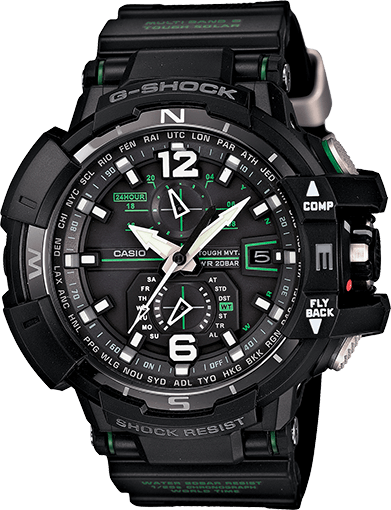 G-Shock GA-1100 - The GA-1100 aviation watch has slightly different styling than the GA-1000, like its arrow-shaped hour and minute hands. It also has an analog subdial that can display another time zone. 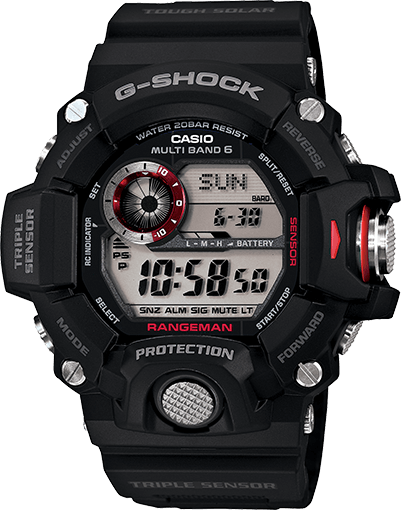 G-Shock GW-9400 Rangeman - The GW-9400 Rangeman is one of the most popular high-end digital G-Shock models and is a favorite of outdoor enthusiasts. 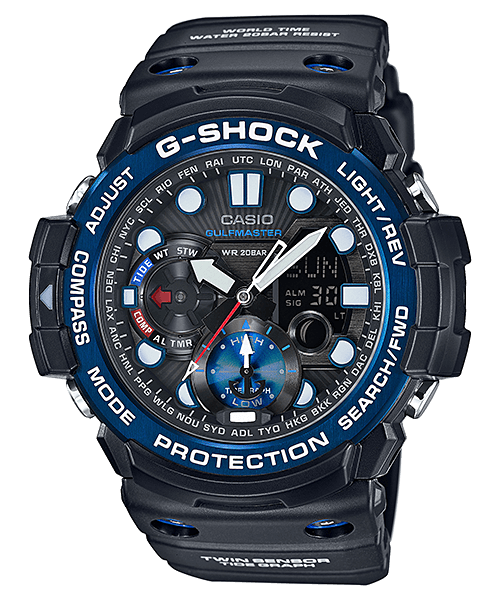 G-Shock GN-1000 Gulfmaster - The GN-1000 is a stripped down version of the GWN-1000 Gulfmaster that has a Twin Sensor (compass/thermometer) instead of a Triple Sensor and no Tough Solar power or Multi-Band 6. 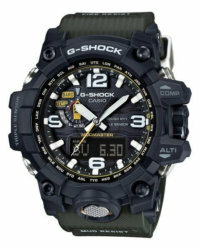 G-Shock GG-1000 Mudmaster - The GG-1000 is a new Mudmaster model with the Twin Sensor (compass/thermometer). Like the GN-1000 above it does not feature solar power. 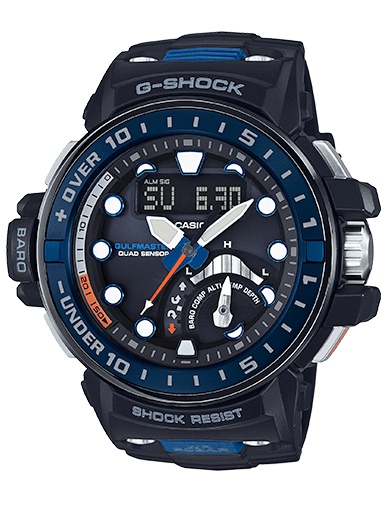 G-Shock GWN-1000 Gulfmaster The GWN-1000 Gulfmaster is an analog-digital model that has a large, instrument-like display similar to the aviation models but with a maritime theme. The Gulfmaster is aimed at boaters but is also popular for its unique look. 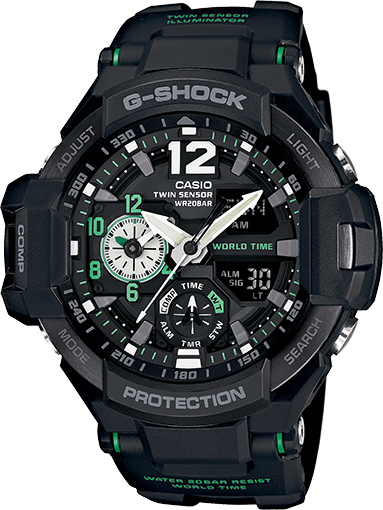 G-Shock GW-A1100 - The GW-A1100 is a high-end aviation watch featuring Triple G Resist for resistance to shock, g-forces (up to 12g), and heavy vibration. 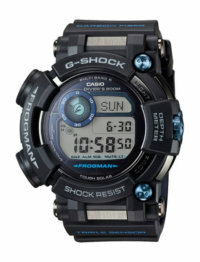 It is currently the only G-Shock compass watch with a fully analog display. 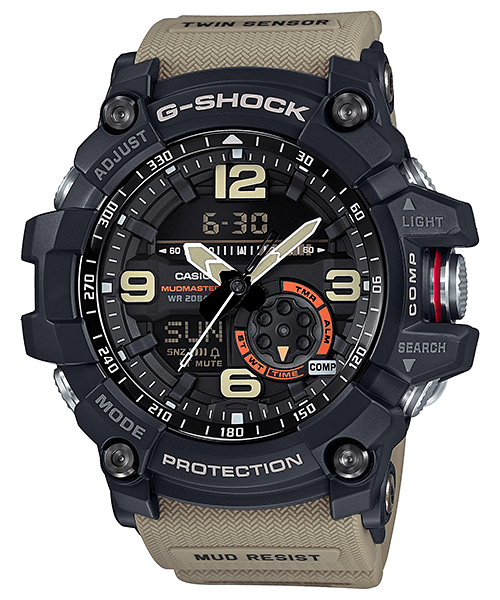 G-Shock GWG-1000 Mudmaster - The Mudmaster is a popular new model that has a protected button structure like the Rangeman with a tactical style analog-digital display. 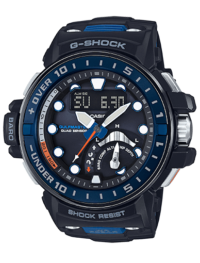 G-Shock GWN-Q1000 Gulfmaster - The GWN-Q1000 is the first G-Shock with a Quad Sensor which includes the altimeter, barometer, compass, and thermometer of traditional Triple Sensor models and adds a water depth meter for diving use. 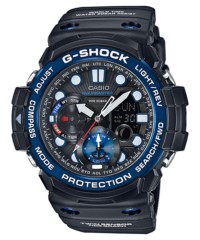 G-Shock GWF-D1000 Frogman - The GWF-D1000 is the latest Frogman model now featuring a Triple Sensor that differs from the traditional one in that instead of an altimeter/barometer sensor it has a depth gauge sensor to measure underwater depth when diving. Other new features include a sapphire crystal and carbon fiber insert band. For more compass-equipped watches see our Best Casio Pro Trek ABC Watches.